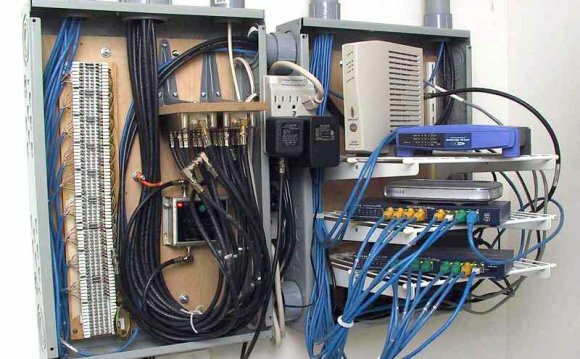 Next, you'll want to find a good spot for all of the cables to meet at or the junction point; this is where you'll put your switch or router. Keep in mind that you'll have multiple wires coming out of your wall at this point. For this reason many people opt to have this location in a closet or behind a desk. Personally, I chose to have this be in my office closet. My reasoning is that it is centrally located in the house, it's out of the way, and it's still easily accessible if I want to make some changes. Once you've found this junction spot, try and measure the distance from this spot to the desired locations in each room. The best way to accurately measure the length you'll need is to imagine connecting a string from the junction point (where the router is) to the wall outlet. Always overestimate, and take into account that you might need to run the wire under your house, in the attic, or even through that walls!